It has completed its formalities of registration as incorporated charitable trust and as a company with Inland Revenue Department of New Zealand. Above four Varg Already held. The full time volunteers and members of coordination committees of SVOs, Anchals and Sankuls of the states of Jammu and Kashmir, Uttrakhand, Himachal, Rajasthan and Uttar Pradesh participated in the Samanvaya Varg of North Zone of India. 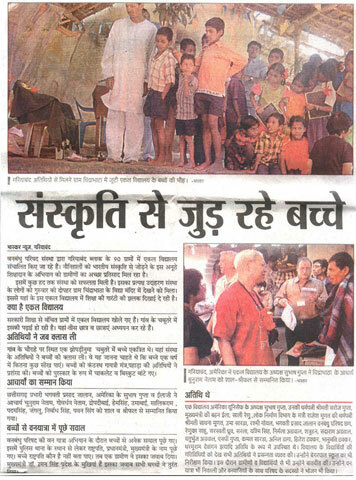 The Varg was held from 23rd-25th February 08 in the holi city of the lord Shiva, Varanasi. The city is the great pilgrimage attraction for Hindus all over the world. No wonder Mr. Subhash Gupta, president EVF US and his wife Saroj Gupta, Shri Ramesh Bhai Shah, Sec EVF USA and one of the senior Trustee of EVF Board USA, Brahama Ratan Agarwal also chose Varanasi to attend the Samanvaya Varg. The participation of large number of Coordination committee members was a significant feature of the varg. Ten sessions of the varg were well distributed over two days and appropriately divided into small groups for discussions. The participants were given ample time to deliberate over the subjects and interact with each other freely. Among the subjects discussed were Revise System Policy, Local Ownership of Ekal Projects, collection for self sufficiency by Local committees and Nagar Sangthan working at state, Anchal and Sankul levels. The reporting of different Partner Organizations of Ekal Abhiyan were also important. Right form inaugural session to the end, the atmosphere of the varg was charged with zeal and enthusiasm. The cultural evening on 24th Feb. was enjoyed by all. 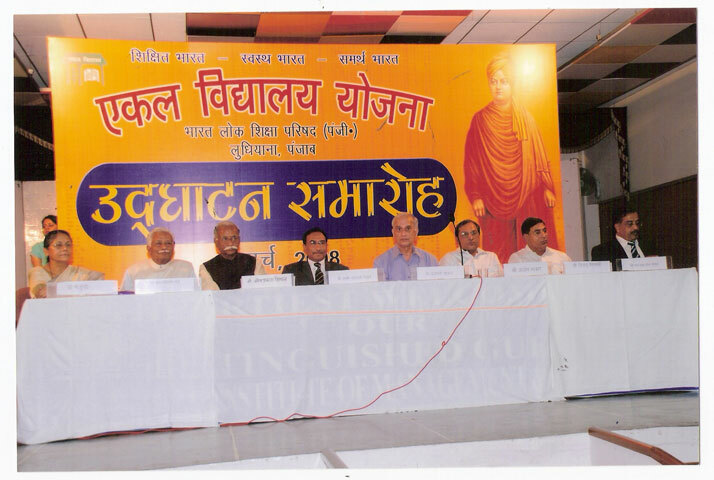 The eminent industrialist and social worker Shri Kashinath Jhunjhunwala and professor Dr. Kushwaha, Ex Vice Chancellor of Kashi Vidyapeeth were the honorable guests on the occasion of inauguration, Shri Arivind Kumar Agarwal, President of Bharat Lok Shiksha Parishad Varanasi, extended warm welcome to one and all. 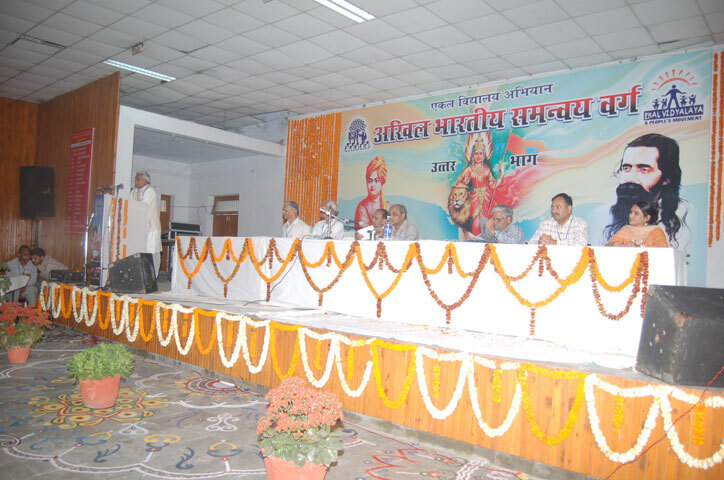 Shri Shyam Ji Gupta’s speech ignited everybody to plunge into the sea of Abhiyan. 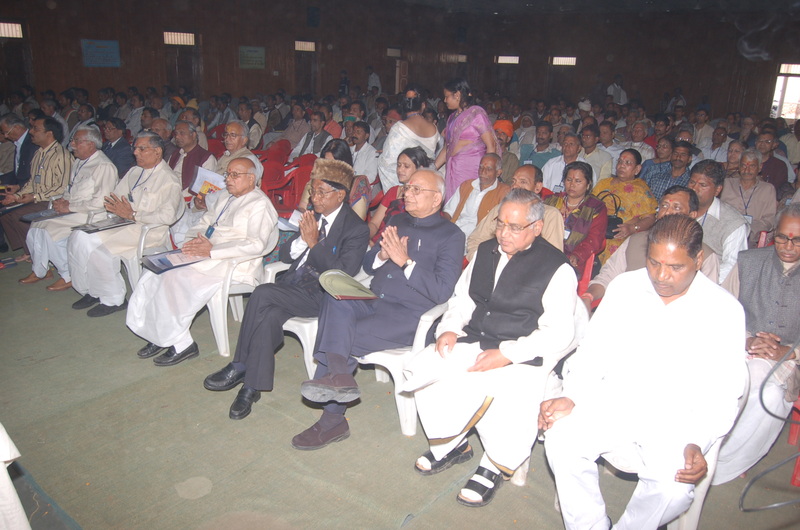 Prominent office bearers of FTS, BLSP, Arogya and Gram Vikas were present in the Varg. The credit for successful organization, excellent management of Varanasi varg goes to the team of Samanvaya Samiti of Varanasi. The fourth chapter of BLSP, the partner organization of Ekal Movement was inaugurated in Ludhiana on 2nd Mar 2008. This is the First Chapter of Ekal in Punjab. Dr. Yaspal Lakra, Chairman of the EVF US Board came all the way from Detroit Michigan to grace the occasion. He gave the welcome speech. 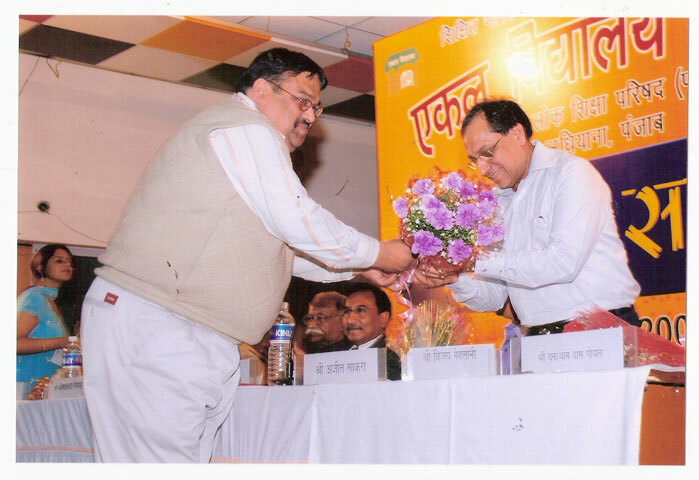 Shri Laxmi Naraian Goel, Managing Director Zee News and ESSEL GROUP of industries, was the chief guest. 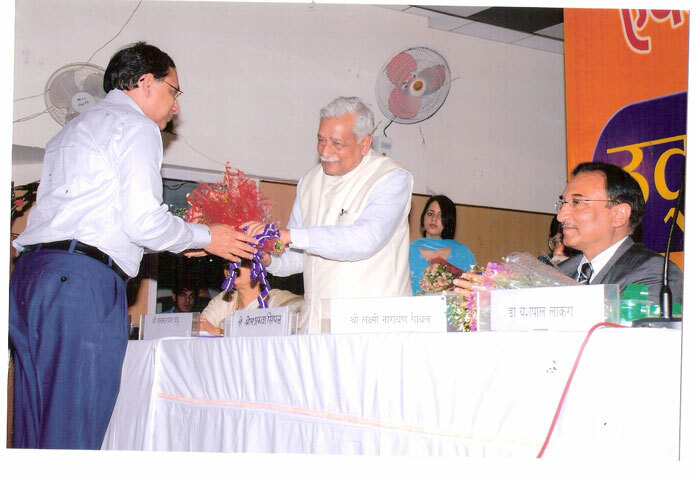 He appealed the affluent people of the society to join the Ekal Movement. Smt. 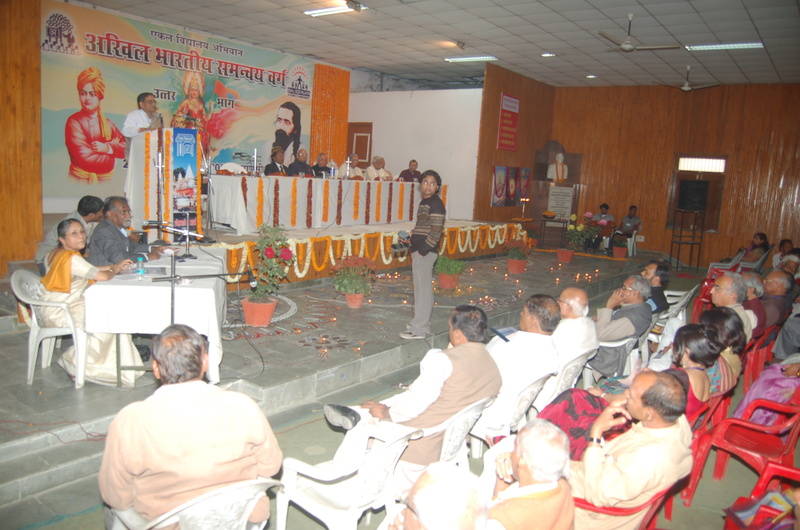 Manjushree was the main speaker. 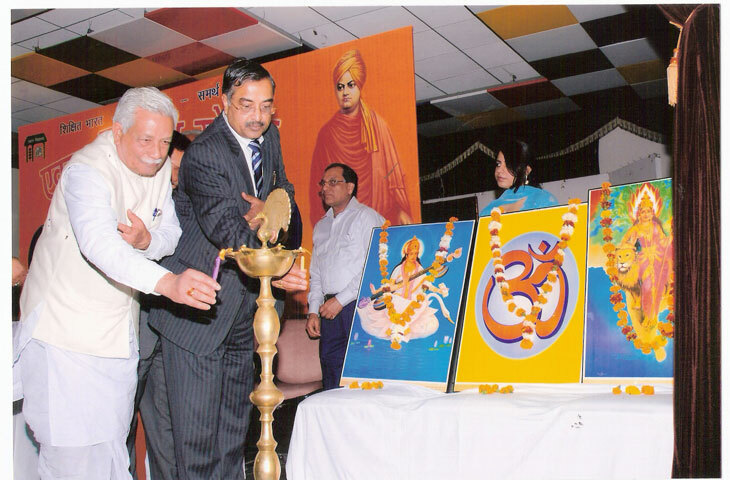 Shri S. N. Bandhu, G.D. Goel and Naresh Jain National President, Gen. Sec. and Treasurer, of BLSP respectively, along with G.S. Gupta and Sangita Gupta and others arrived to celebrate this occasion. 270 Ekal schools of Ferojpur Dist. (Anchal) in Punjab have been adopted by Ludhiana Chapter. 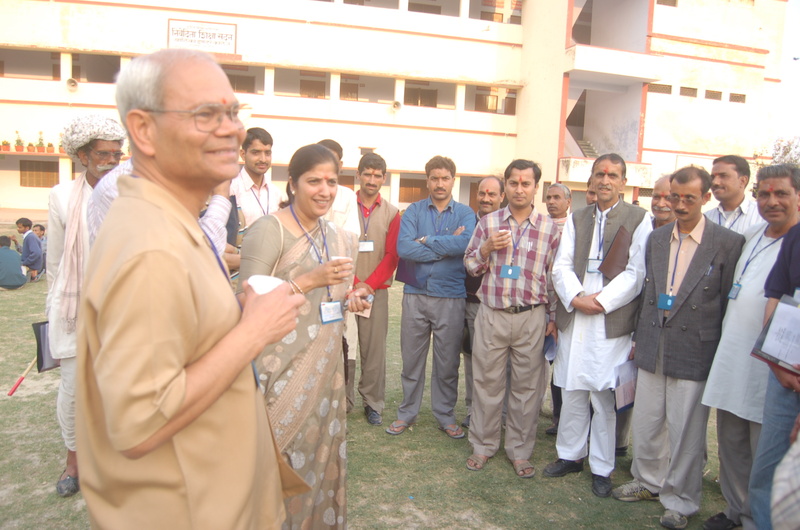 The chapter team under the leadership of president Shri Ajit Lakra, Secretary Shri Vijay Mehtani and Treasurer Shri Uma Kant Tripathi has owned the responsibility of visiting and supporting the schools of the border areas. The opening of the chapter has given a boost to field units of Ekal in Punjab. Amritsar and Jalandhar will also be BLSP chapters in near future. The event of inauguration was given good publicity in many prominent News Papers. 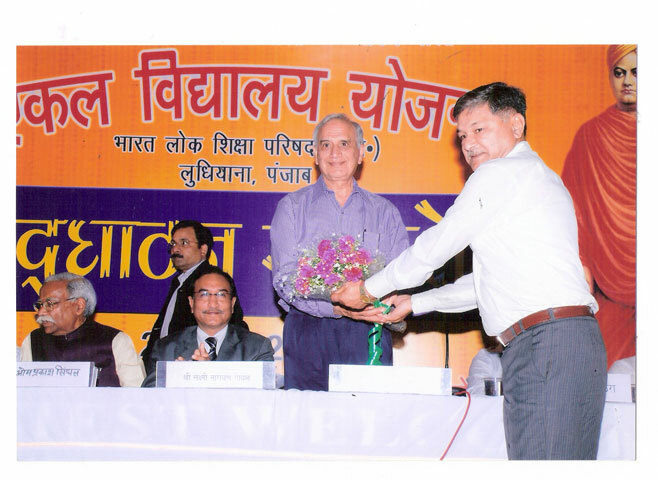 During the visit to India this year, we visited an Ekal Vidyalaya. It was an inspiring and overwhelming experience to see a functioning school in a remote village. The village Bhutakheda is located about 325 Km. from the city of Indore in Madhya Pradesh. The nearest main road is about 12 Km. The approach road to the village is mainly dirt and rocks, and a good 1.5 hour journey by car from the main road. The village has a population of about 500 people. There is no electricity in the village. The main livelihood is farming. 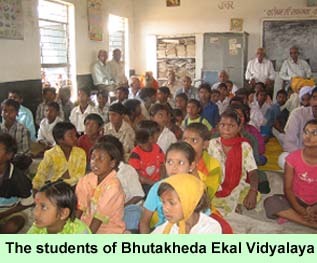 About 30 students attend the vidyalaya. The village is fortunate to have a permanent building for the school. When we arrived at the village, we received a very warm welcome by about 100 -125 people. After formal welcome, we went to the school. The teacher, Maya, is a local girl about 20 years of age. She knew how to handle kids. 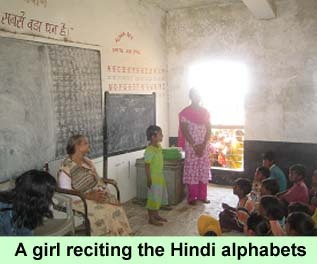 She was trained by the Ekal Vidyalaya people on how to teach the children in a systematic and easy to understand way. Every 6 months, she goes for a training course to the nearby city. The class started with a prayer and chanting of mantras. Children then demonstrated their knowledge of Hindi alphabets, numbers, simple addition and subtraction learnt at the Ekal Vidyalaya. They wrote complex Hindi words on the blackboard. These skills would be used later, when they owned and farmed their own fields. It would stop them from being cheated or losing any money, as they would be able to read contracts and work out fair payment. They also had general awareness about things such as who the Prime Minister of India is. At the end of the class, they sang some bhajans. The children were all disciplined and attentive in class. We were quite impressed with the general cleanliness and hygiene of the village and its people. We found out that apart from a teacher, the school also have a “health instructor”. She is also a local girl, who teaches children about hygiene and health. The school runs in the evening, because some children help their parents in farms during the day. Because there is no electricity in the village, they study with the help of kerosene lamps. The teacher drops each child to their homes after the class. The dedication of children and the teacher was quite amazing. After our class visit, we spent some time with the villagers. They seemed to understand the importance of education, and felt very privileged about having Ekal Vidyalaya in their village. Our trip was organized by the Bhopal office of EVF, India. We were very impressed with their organizational skills. Everything went as per the plan. 2 EVF staff accompanied us to the village. We found them completely selfless and dedicated to the cause. To make sure that everything is going well, every two to three months, Ekal volunteers visit the village. They talk with the villagers about any problems that they might be having with the school, as well as making a report and grading the standard and progress of the students in the school. We found that the Ekal volunteers and villagers have developed a good bond between them. The whole system is very well organised. Every school, even in the most remote parts of India, are looked after. 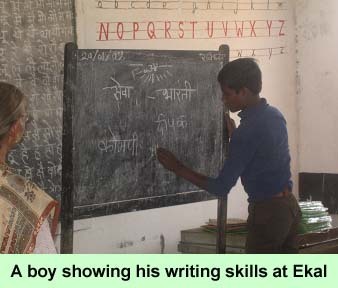 Ekal has opened a total of about 24,000 schools, and has more than 720,000 students. We were amazed at the happiness of the people. This trip made us realise how lucky we were to have a chance to have a good education. These children are the future of India and deserve a chance. It’s only fair that these children get a chance at a proper education too, and advance along with the rest of India. We are the ones who can help them in achieving their dreams. Sri Khagen Rajuar was a student of Ekal Vidyalaya, Bilongni Tea Estate, under Chabua Sanch of Dibrugarh (then Tinsukia) Anchal. He was an irregular student of class three in a nearby primary school and his study was about to stop. But the Acharya of Ekal Vidyalaya Sri Gopal Rajuar met the guardian of Khagen and asked them to send Khagen to Ekal Vidyalaya. 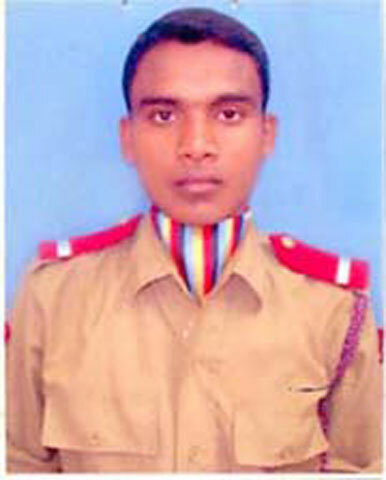 Khagen started coming to Ekal Vidyalaya and enjoyed doing physical exercise and singing songs besides the studies. 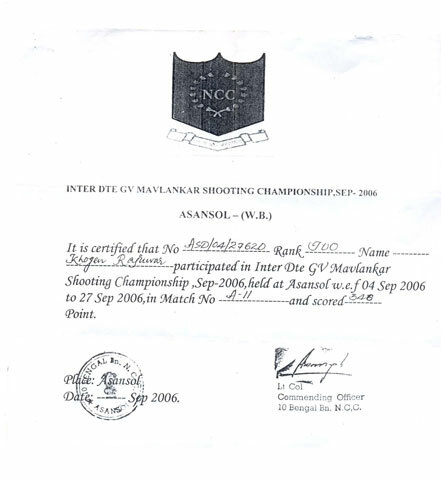 He became a regular student of Ekal Vidyalaya. 1. 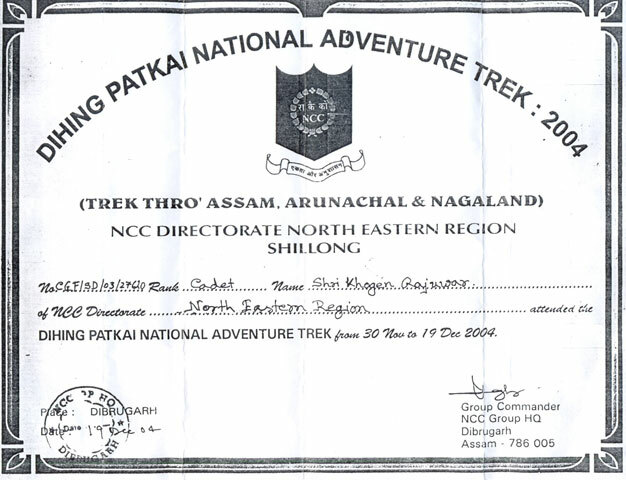 Participate in many Camp held by N.C.C. Now he is Sanch Pramukh of Ekal Vidyalaya Yojana, Chabua Sanch, Dibrugarh Anchal.